Can We Help Our Students and Ourselves Avoid Distraction? Many of us as faculty members contend with distraction. Our own and that of our students. Some of it occurs in our offices. Or at home, trying to do homework (whether that is writing a paper or grading one). During reading. And, of course, during class. While not all distraction comes from technological devices (children, cats, dogs, friends, a boiling tea kettle can all provide plenty of distraction! ), most of us have experienced our lighted screens and chiming alert signals as distractions. This excellent article entitled “The Distracted Classroom” by James M. Lang in The Chronicle of Higher Education begins a series in which Lang will distill for his readers information he is gleaning from his reading of the book, The Distracted Mind: Ancient Brains in a High-Tech World (MIT, 2016) by neuroscientist Adam Gazzaley and psychologist Larry D. Rosen. Of particular interest, I thought, is the focus beyond the well-known point that technological devices can cause devastating distraction to learning. Instead, Lang draws our attention to the book’s proposal that distraction occurs when “we are pursuing a goal that really matters and something blocks our efforts to achieve it.” That something is an obstacle that our ability to control our minds runs right up against. 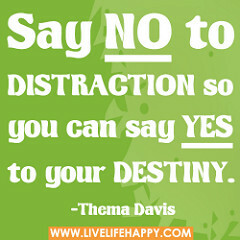 We want to focus on our goals, but our mind directs its attention to something else and we can’t seem to stop it. This has significant implications for how we shape what occurs in our classrooms both online and on the ground, and how we shape “homework,” or flipped classroom work, so that students are able to fight distracting influences. I have always done a lot of meta-teaching in my career. I spend time in every class, almost every week, teaching students how and why I have designed the class the way I have. I think this helps them experience the lessons as something designed and purposeful, not just as random busy work. But could I do more to support their motivation to achieve learning goals? To help them fight distraction? I’m going to think more about that, especially as I begin writing my syllabi for the Fall semester. I look forward to the rest of Lang’s series. Posted on March 27, 2017 Categories Education, TeachingLeave a comment on Can We Help Our Students and Ourselves Avoid Distraction? Are you a user of Moodle and Moodle’s gradebook? If so, have you ever wondered: How do I get my course total grades in my grade book to show up as percentages instead of as total numbers? I wonder this each and every semester, and every semester I have to look up how to do it! But this semester, I’ve decided to write a tutorial post about it, because I know doing so will help me remember it better. If you prefer to read a Google Doc which contains screenshots, you can find that here. Otherwise, read on for the step-by-step instructions. So, how do we get our course total grades in our grade books to show up as percentages instead of as total numbers? When you find the Administration tab, click it. If it opens to Grader Report, click on the drop-down menu in that window to get more options. Then, click the Gradebook setup ( in Moodle 3.0) option. In the Category Total area, click Show More. Select Display grade type and click on that drop down menu. You will see many choices there! Choose a setting that contains percentage. Return to your grader report view (see steps 1 and 2 above) to view the changes. As you know if you read this blog much, I’m a strong believer in combining both the verbal and the visual to students in their learning. I think practices like sketchnoting help students synthesis, evaluate, understand and retain material in important ways. Whether I create visual/verbal learning materials for them, or whether they create them for me as notes or quiz alternatives, or as part of written projects, such works seems to have sparks of liveliness and individuality–as well as the intellectual content–that “same old, same old” projects don’t have. Anyhow with this in mind, I decided to try something new. Using a visual/verbal creation to communicate with my advisees. I don’t know about you all, but my advisees often to do not read (and therefore, do not follow) the instructions I give them to best prepare for our pre-registration advising sessions. If them arrive unprepared, I can’t help them. They have to leave, prepare, then find another time to see me, which often is after their assigned registration time. This causes all sorts of kerfuffle as they run a higher risk of missing out on spots in their preferred classes the later they register. So this year I took my long and detailed email of instructions and distilled it down to its main points, added a narrative shell, and wrote a comic. I test drove pencil sketch versions of it on some colleagues and some advisees who helped me through the editing process. Then I produced it as an 8 page mini-comic, which I produced on paper and mailed to all of my advisees. Then using Piktochart (my favorite infographic program), I created it as a scrollabe website, which you can find here. Finally, using Piktochart’s export function, I created it as a .png file, which I have embedded below. I will be emailing this to my advisees as well. This was a project brought about by a situation where communication failed too often between and my students, frequently to their consternation. So, I’m trying something different, which I can use to communicate with them on paper and online. Now that I know how to do all of this (having walked through it in the steps I’ve mentioned above–and all without expensive Adobe products, which I use, but which I also realize not everyone has access to), I’m really interested in playing with more ways the visual and verbal combinations (especially comics) can be used to enhance teaching and learning–particularly online. I’ll let you know how my advisees respond to this after our next registration period in early April. Robert Talbert from Grand Valley State University writes an excellent blog called Casting Out Nines, which I recommend for thoughts on teaching, tech, and specifically math education. Recently he offered his thoughts on whether or not untenured faculty should experiment with the flipped classroom model. I think his ideas–which are focused toward faculty who work at institutions which value quality teaching–apply not only to the flipped model, but to any aspect of pedagogical experimentation, and no matter where you are in your career. His foremost piece of advice mirrors my own to faculty I work with: pick a course you are going to teach in a year and begin to work on it now. One cannot do a good job flipping a classroom (or redesigning a course for the hybrid or online environment) in a rush. You need time to re-design, review, revise, create and curate materials, possibly even test drive them on some willing students or colleagues. He provides other great advice specifically for those in a pre-tenure situation.